Combining bathing in mineral water with physical rehabilitation carried out by qualified instructors. Gymnastics in the water allows you to do suspension exercises, has a positive effect on the movement system, cardiovascular system and respiratory system. It is a bath in thermal water. It triggers a thermal reaction in the internal organs, moves blood to the periphery and vice versa, relaxes skeletal and smooth muscles, increases the secretion of sweat and urine. Gymnastics in the water allows you to do suspension exercises, has a positive effect on the movement system, cardiovascular system and respiratory system. It triggers a thermal reaction in the internal organs, moves blood to the periphery and vice versa, relaxes skeletal and smooth muscles, increases the secretion of sweat and urine. An ozone bath is a bath in the therapeutic thermal water, to which the air enriched with ozone particles is supplied through the mat. The aim of the treatment is massaging of the body immersed in water with a huge amount of air bubbles. Very good therapeutic effects are enriched by the advantages of pearl-ozone bath in specially developed essential oils or healing salts: refreshing, relaxing, regulating the circulation and metabolism of tissues, cleansing, firming the skin. The carbonic acid (CO2) bath is obtained by mixing mineralized water with carbonic acid anhydride. Included in water carbonic acid anhydride secretes on the skin in the form of gas bubbles and causes many changes in the body through the expansion of arterial and venous capillaries. As a result, blood pressure is reduced. The CO2 bath also has a soothing and relaxing effect. The pearl bath is made in a tub with mineral water, to which compressed air is applied at a pressure of about 1 atmosphere. Bath in water saturated with air bubbles has a relaxing, calming effect, stimulates circulation and improves metabolism, has as well a hypnotic effect. Pearl-mud bath is performed in a bathtub with healing thermal water and with the addition of peat, i.e. a type of peat containing organic components, e.g. humic acids, bitumines, proteins, amino acids, resins and waxes, undegraded plant components and inorganic components - mineral. In addition, compressed air with a pressure of about 1 atmosphere is supplied to the bathtub. Therapeutic effects: it soothes and relaxes. It improves microcirculation and supports the elimination of toxins. Reduces the discomfort caused by physical exertion and overload. 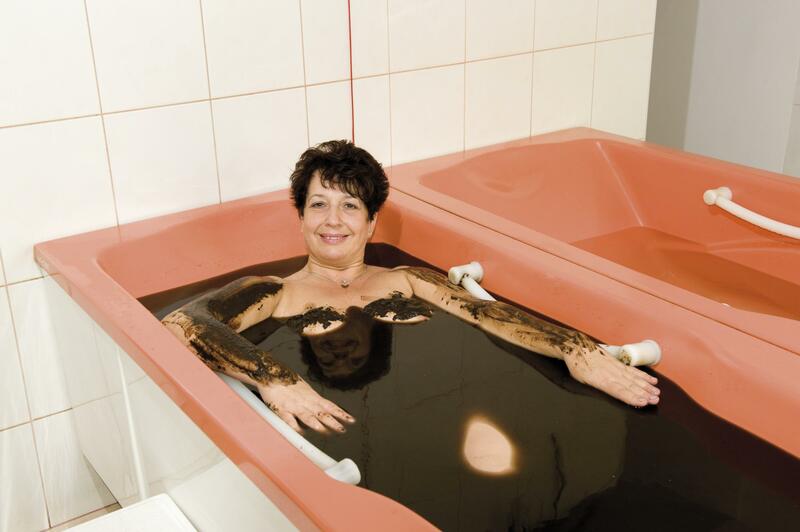 Bath in a peat suspension. The mud is a type of peat containing organic components, e.g. humic acids, bitumines, proteins, amino acids, resins and waxes, undegraded plant components and inorganic components - mineral. Stimulation of blood circulation, acceleration of pulse and breathing, redness of the skin, transient increase of blood pressure, acceleration of metabolic processes and anti-inflammatory effects of peat components. The peat also facilitates the absorption of exudates appearing in various disease states, has analgesic effects and improves blood circulation. In the action of peat treatments on the body plays an important role their high heat, causing overheating of tissues. It causes stimulation of blood circulation, acceleration of pulse and breathing, redness of the skin, transient increase of blood pressure, acceleration of metabolic processes and anti-inflammatory effects of peat components. An electric bath using four bathtubs filled with water and direct current on the limb. The current may flow from the lower limbs to the upper or from the upper to the lower limbs. The treatment has effects in some diseases of the cardiovascular system. Depending on the direction of current flow during treatment, different therapeutic effects are obtained. A four-cell bath increases or decreases the excitability of the central nervous system. A reduction in blood pressure or elevation depending on the direction of the current flow is obtained. The four-cell bath has also an analgesic effect. Depending on the direction of current flow, a calming effect, lowering blood pressure or stimulating, increasing blood pressure is obtained. This treatment uses for therapeutical purposes the thermal influence of water and its mechanical influence associated with the whirling movement. The treatments are performed in tanks, adapted to treatments on the upper limbs, lower limbs or for the whole body. These tanks are equipped with mechanical devices that introduce water into the vortex motion. Whirling massage (whirling bath) is a form of a mild massage combined with the influence of heat. It causes loosening of tissues, reduction of muscle tone, improvement of blood supply and alleviation of pain. The procedure is performed in a bathtub in therapeutic thermal water by a physiotherapist using a stream of water at a pressure of 1-4 atmospheres. The treatment is performed on the entire body of the patient. The treatment stimulates circulation, relaxes muscles, alleviates pain, increases metabolism and reduces nervous tension. 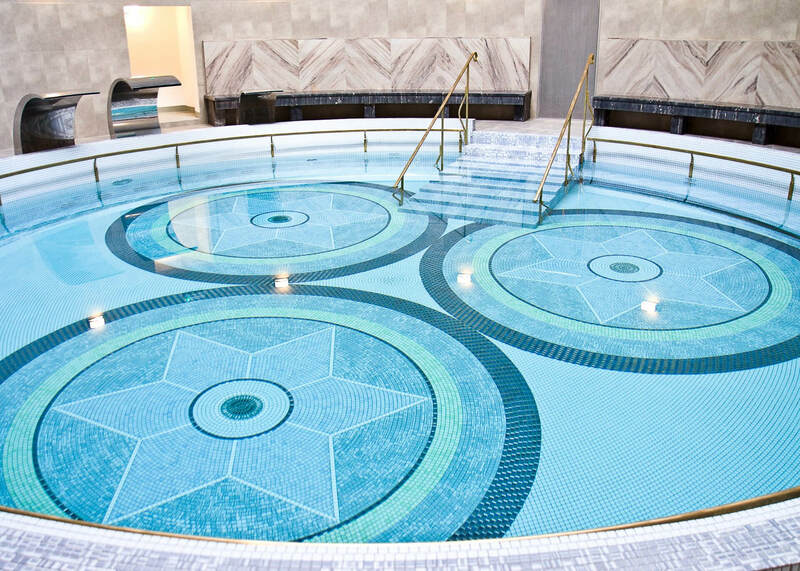 The treatment is performed in a bathtub in the therapeutic thermal water using compressed air escaping from the nozzles on the bathtub walls. Therapeutic effects: temperature, pressure and mechanical irritation with shattered water droplets accelerate the metabolism. It has a loosening, calming and relaxing effect. It stimulates blood circulation. A hydrotherapy treatment in which pressure and temperature of one or many streams of water striking the body have a significant influence. 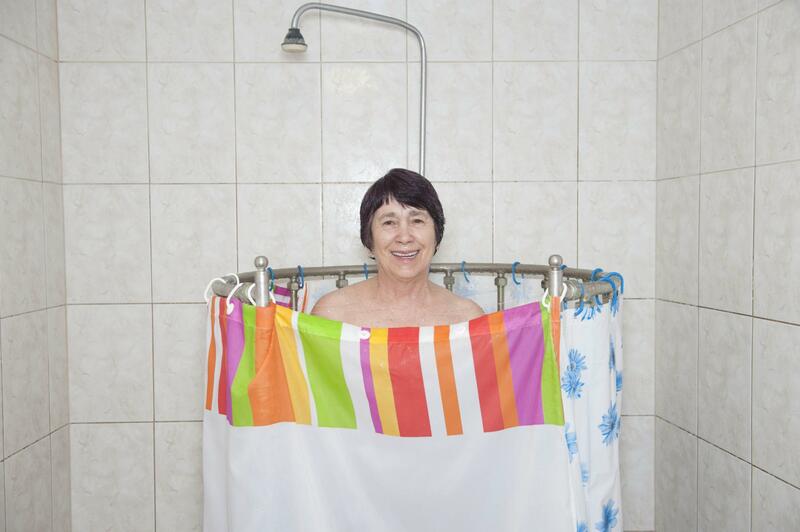 The showers have a soothing and relaxing effect, causing a decrease in blood pressure and skin hyperaemia through the dilation of blood vessels. A hydrotherapy treatment in which pressure and temperature of one or many streams of water striking the body have a significant influence. These showers maintain a constant direction of incidence on the body of water from nozzles placed in the walls of the shonwer enclosure..
As a result of the treatments, the patient feels the comfort of seeing because the eye is better hydrated, nourished and supplied with blood, so the amount of used drugs for eye moisturization is significantly reduced and periods of remission are prolonged. The therapeutic effect lasts for about 6 months. chronic and recurrent uveitis (from acute inflammation should pass min. accelerate the clearing of the airways, increase the secretion of mucus, stimulate the migratory movement of the cilia in the mucous membrane, relax the secretion of the airways and facilitate its evacuation have a soothing effect (low concentration of mineral salts) act stimulating, congestive (high concentration of mineral salts). The treatment consists in covering the body with mud which is a type of peat containing organic components, e.g. humic acids, bitumines, proteins, amino acids, resins and waxes, undegraded plant components and inorganic components - mineral. It causes stimulation of blood circulation, acceleration of pulse and breathing, redness of the skin, transient increase of blood pressure, acceleration of metabolic processes and anti-inflammatory effects of peat components. The peat also facilitates the absorption of exudates appearing in various disease states, has analgesic effects, improves blood circulation and reduces muscle tone. In the action of peat treatments on the body plays an important role their high heat, causing overheating of tissues. Peat slices are used for local compresses. Molded mud is a type of therapeutic peat with specific physicochemical properties. The healing factors are estrogenic bodies, humic acids, vitamins, proteins, resins, waxes and tannins. The treatment consists in applying crumbled and mixed with water paste at a temperature of 40 degrees - 45 degrees C directly on the body. The treatment consists in covering the body with mud in the form of poultices. The mud is a type of peat containing organic components, including humic acids, bitumines, proteins, amino acids, resins and waxes, undegraded plant components and inorganic mineral components. Therapeutic effects: stimulation of blood circulation, acceleration of pulse and breathing, redness of the skin, transient increase of blood pressure, acceleration of metabolic processes and anti-inflammatory effects of peat components. The peat also facilitates the absorption of exudates appearing in various disease states, has analgesic effects, improves blood circulation and reduces muscle tone. The treatment consists in making of sterile mud in the form of poultices for eyeballs. The treatment consists in covering the body with mud which is a type of peat containing organic components, e.g. humic acids, bitumines, proteins, amino acids, resins and waxes, undegraded plant components and inorganic mineral components. The procedure involves the use of mud in rectal infusion. Classic massage is a set of various manual procedures that work on the skin, subcutaneous tissue, muscles, joint capsules and ligaments in a mechanical way, as well as in the form of reflex changes on the circulatory, nervous, endocrine systems to internal organs, inclusive. Massage, the essence of which classic form is the mechanical exertion and release of the grip on the body tissue, is one of the oldest methods of physical therapy. Massages are indicated in all the disease states where there is a need to improve skin turgor and trophics, remove skin blood supply disorders, remove venous and lymphatic stasis, accelerate muscles relaxation, regulate their tension, relieve pain, stimulate metabolism, mental stress relief, etc. Mechanical irritation of receptors improves local circulation, accelerates the absorption of exudates and transudates, increases the secretion of endocrine glands. Called a vibration massage, a dry procedure performed with the help of a special apparatus through which water flows, which creates vibrations of the membrane in the applicator. Massage of large and small muscle groups and subcutaneous tissue improves peripheral circulation. diseases: rheumatic, orthopedic-traumatic, spine, sciatica syndrome, headaches, some diseases of internal organs. Lymphatic drainage is one of the specialist healing treatments. With the help of smooth and delicate hand movements of the therapist or other devices created for this purpose, the lymph circulation is improved. prevention of diseases resulting from swelling, inflammatory, oncotic and lymphatic edema. In addition, drainage improves the transport of nutrients, improves the functioning of the immune system and contributes to the quick removal of toxins from the body. PNF-Proprioceptive Neuromuscular Facilitation is a comprehensive therapy used to re-educate or reproduce a specific motor function, lost or disturbed as a result of the disease. The PNF method is used in a large number of disease entities that cause musculoskeletal dysfunctions, from light to very severe, mainly in the field of neurology and orthopedics. The form of treatment of problems related to the musculoskeletal system. By means of special techniques of mobilization and manipulation of peripheral joints and spine, as well as work on soft tissues, it is possible to improve the range of motion and reduce painfulness and inflammations. The DEEP OSCILLATION device works in such a way that the current flows back and forth, causing corresponding changes in the field frequency. A strong pulsing electric field is created between the applicator and the patient's body. The electric field penetrates through the tissues and interacts with the charges in the patient's body (in the tissues there are a lot of ions). In addition, there is a spontaneous polarization of particles and elements of the human body (the field shifts related loads). Because this field is variable and permeates the whole body, it causes vibrations in deep layers. Deep oscillation - physiological basis. The healing of tissues is often complicated and is stopped in the initial phase, i.e. inflammatory phase and during the formation of granulation tissue. We have the following phases of wound healing: cleansing, i.e. inflammation, remodeling, i.e. epithelial, vessels and nerves growth, cell migration, and shrinkage and scar formation, i.e. synthesis of collagen and collagenisation. Destruction of extracellular matrix (ECM) by uncontrolled release of proteases is the main factor preventing healing complicated wounds. During wound healing, complex chemical reactions of locally active, biologically active substances take place, as well as physical phenomena expressing, among others, increase in tensile strength. In the case of impaired healing, the proteases are overproduced and their activity is excessive. Such wounds remain in the inflammatory phase and can be increased and maintained for many months without appropriate therapy. If vibrations take place in the body when using deep oscillation therapy, transport can also take place, and if you can control transport, you can deliberately interfere with the physiological processes of nutrition of tissues. Vividly depicting the tasks of deep-oscillation therapy, we can say that they are: cleaning, dissolving, rinsing and draining. The use of deep oscillation leads to a significant acceleration of the healing process of damaged tissues, which is of great importance for physiotherapy. First of all, faster healing significantly improves the quality of scar tissue, which allows for faster and more effective introduction of other rehabilitation methods, especially kinesitherapy. This, in turn, implies not only a faster return to normal tissue function, but also a significant improvement in its quality. A special space for research into the use of this system seems to be in the area of ​​sports traumatology, where quick but also reasonable iprovement is of inestimable importance. Post-operative treatment - Wertheim operation - the aim of therapy: reduction of congestion, pain, stimulation of bladder and intestines, facilitation of movement and support of wound healing. In cases of mechanical injuries and injuries caused by overloads and neurological damage, DEEP OSCILLATION® has anti-inflammatory and anti-edema and analgesic properties, improves tissue nutrition and directly stimulates regenerative processes. It enables faster return to active rehabilitation and training. In patients after stroke, deep oscillation is used for lymphatic drainage in particular of the head as well as to improve the nutritional status of tissues in areas affected by hemiplegia. In cases of fibromyalgia, Sudeck's disease and others, accompanied by chronic pain, swelling and hyperahesiasis, the DEEP OSCILLATION® provides a strong pain relief effect also in post-traumatic pain. The use of the deep oscillation after training brings a rapid effect of lowering post-workout muscle tone and reduces the effects of delayed muscular pain syndrome (DOMS), relieves pain and directly counteracts microinjury. Under the influence of the procedure, residues of metabolism, including cytokines, are removed much more quickly. This action leads to impaired nutrition of muscle cells and accelerates the return to normal performance. Thanks to this, the period of regeneration between trainings is shortened. Because the deep oscillation has anti-swelling effects, prevents tissue fibrosis and accelerates the removal of toxins, it is a very good complementary therapy before and after liposuction and in cases of other invasive procedures in the field of aesthetic medicine. Skilful use of a special tape that sticks to the patient's body to achieve the intended therapeutic effect. This method is gentle and safe, so you can use it without problems in children, the elderly persons and pregnant women. The tape does not give any allergic reactions, and a one-time application is enough for a few days. Kinesiology taping is called a "24-hour therapist" because it works at any time after applying the tape. The treatment consists in stimulation of tissues with acoustic waves and simultaneous application of the electric curative current. The apparatus is adapted to produce a continuous ultrasonic wave and modulated into pulses with a factor of 1: 10 i 1 : 20. Electroplating is an electrotherapy procedure that uses direct current with two electrodes on moist pads placed over the affected area. The therapeutic effect of electroplating is related to the different way of placing the electrodes. Depending on the methods, the nerve excitability may be reduced, the electroplating also acts analgesic, anti-inflammatory and causes the expansion of blood vessels. The effect of this field is clearly marked as anti-inflammatory, analgesic and anti-swelling. It also causes the absorption of hematomas. Diadynamics consists in the operation of galvanic current and the impulse current applied to this current, the operation involving the use of low-frequency currents in the form of "impulse currents". Diadynamic currents called Bernard currents, created as a result of the imposition of a single-edged rectified sinusoidal AC current on the DC waveform. Depending on the use of one of the currents with different frequencies, we get action: analgesics, reduction of muscle tone, dilation of blood vessels, increase of muscle mass. 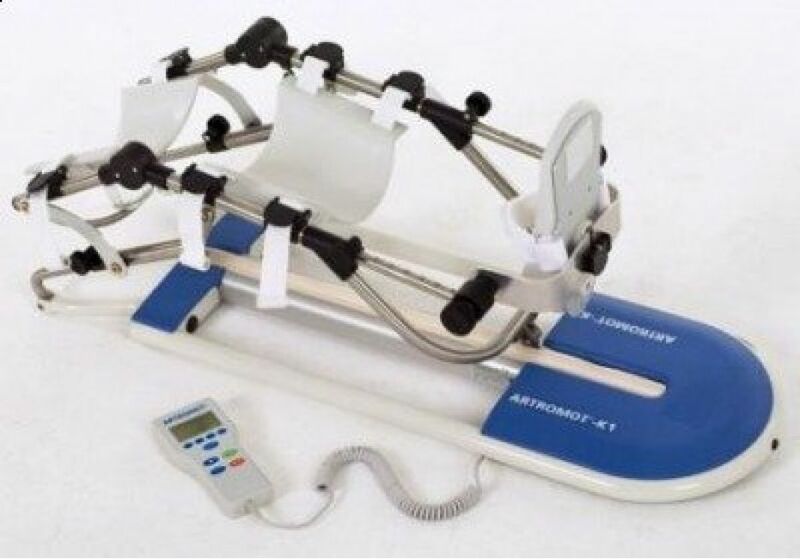 The currents are also used to perform electrosymulation of healthy or slightly damaged muscles, such as paresis or muscle atrophies from inactivity. Sollux lamp for irradiation with infrared and visible rays. The energy of radiation absorbed by the tissues increases the kinetic energy of their molecules, and thus increases the thermal state of tissues, i.e. causes a thermal effect. Medium and high frequency currents with strong analgesia. Therapeutic effects: analgesia is based on a transcutaneous electrical nerve stimulation (TENS). pain syndromes of the spine and joints, neuralgia. Muscle stimulation using a pulsed electric current. The treatment causes controlled muscle contraction, bypassing some or all of the nervous system responsible for the contraction under normal conditions. Therapeutic effects: is widely used in neurological diseases, when the transmission of nerve impulses to the muscles is disturbed. Improvement of muscle strength, blood circulation. The cleansing effect of the body is also obtained. muscle weakness, partial peripheral nerve damage, muscular atrophy, secondary effects of flaccid muscles. The treatment is performed using a lamp for therapy with polarized light, acting on the principle of biostimulation. The treatment accelerates wound healing. Local cooling of the body using gel bags with a negative temperature. The KRIOPOL device allows for local cooling of the patient's body by contact with a stream of cold nitrogen steam below 150oC. Mineral inhalations with the addition of the drug. The procedure is performed only on the order of a doctor. Therapeutic effects: accelerate the purification of the airways, increase the secretion of mucus, stimulate the migratory movement of the cilia in the mucosa, relax the secretion of the airways and facilitate its evaluation have a soothing effect. through the temperature and mechanical pressure of the compress, it improves circulation and facilitates the resorption of exudate fluids. Magnetronik device is designed for therapy with a low-frequency magnetic pulse field. Under the influence of the magnetic field, the ions contained in the cells of the body are displaced causing hyperpolarization of the cell membrane and thus enhance the metabolism, especially during the energy processes taking place. This increases the use of oxygen by the cell. Improved blood supply in the cell during the action of the magnetic field causes the increase of oxygen potential pressure. It was found that improving magnetic field causes pain relief, prevention of inflammation, loosening of tight muscles, improves oxygen absorption by tissues and accelerates regenerative processes, improves tissue nutrition, accelerates bone union, stimulates collagen renewal, improves peripheral circulation, acts as an analgesic, anti-inflammatory and loosening. Depending on the parameters chosen, an analgesic effect may be obtained, increasing the congestion and nutrition of tissues or relaxing, as well as various combinations thereof. The main action of interference currents is analgesic therapy, in addition, they stimulate skeletal muscles to contract, dilate blood vessels and, therefore, improve peripheral circulation. It is an electrotherapy procedure involving the introducing into the tissues by means of the electric fields the ions acting therapeutically. Therefore, only electrolytic dissociative chemicals can be used for iontophoresis. Chemical compounds having such properties are called electrolytes. The duration of the procedure and the appropriate medicine are determined by the physician. Depending on the drug used, e.g. anti-inflammatory or analgesic action. A treatment consisting in precise irradiation of tissues using laser light with biostimulation parameters. The essence of the interaction of infrared laser radiation on the body is based on bringing the energy of increased intensity to tissues located in the depths of the human body, and therefore not reachable by normal physical means. A treatment consisting in precise irradiation of tissues using laser light with biostimulation parameters. 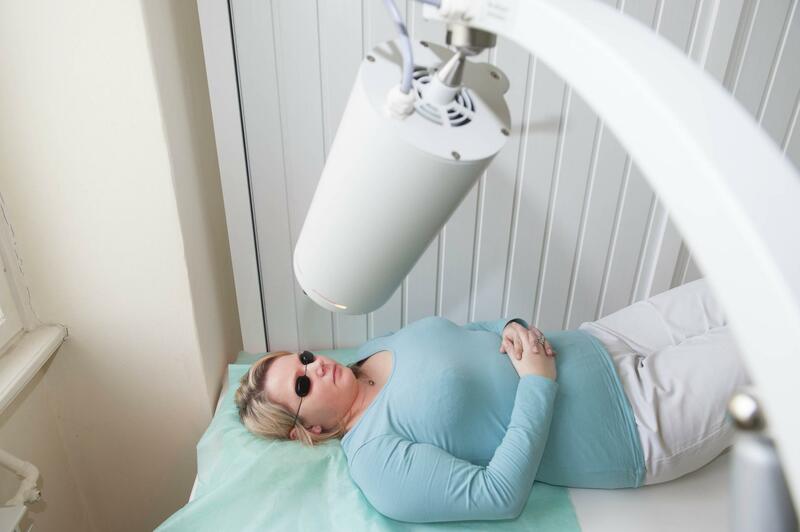 Therapeutic effects: Through its analgesic, anti-inflammatory, anti-swelling, bioregenerative effects, accelerating healing, the laser is used, among others, in sports rheumatology, dentistry, dermatology, medical cosmetology. Exercises performed in a group under the supervision of an instructor in a dedicated gymnasium. Exercises tailored to the capabilities, age and health status of the patient. The duration of the procedure is 20-25 minutes. Restoring physical fitness by developing and shaping the motor organs using specialized rehabilitation equipment. A rail, which enables the knee and hip joint exercises to increase the range of motion in degenerative changes and after surgical procedures. For therapeutic baths we use the Bochnia healing iodine-bromine salt. This salt penetrates the skin during the bath and also penetrates into the blood in a small amount. By acting on the skin receptors, it influences the autonomic nervous system and tissue hormones, causing many local and general reactions, such as reduced sensory and motor nerve excitability, increased blood supply to the skin, normalization of blood pressure, improved cardiac performance, improved blood flow regulation, increased lung ventilation, metabolism stimulation, increased diuresis (urinary excretion), improved immunity and hardening of the body. Therefore, it is often possible to observe a reduction of pain after just a few treatments. The temperature of the total baths is 36-37° C. The first bath time does not exceed 10-12 minutes, each subsequent one is longer by 2 minutes. The optimal bath time is 15 minutes and the salt concentration in the bath is 3%, children are recommended to use brine at a concentration of around 2%. skin diseases, especially psoriasis, prurigo and skin allergies. developmental disorders of the reproductive organs. It is a variation of an instrumental massage performed on a bed with a special structure in a lying position. The massaging factor is heated water jets, which move with circular movements under the elastic rubber membrane on which the patient lies. The membrane also serves as a protection for the patient against direct contact with water. Depending on the indications, water jets may move from the feet up to the cervical spine, centrally on the periphery or it may be limited to a selected part of the body mass. Massage of this kind as a result of mechanical and thermal impact of water on massaged tissues, results in a similar effect to classical massage. The healing effects are analogous to the classical therapeutic massage. The pearl bath is made in a tub with mineral water, to which compressed air is applied at a pressure of about 1 atmosphere. Such a bath has a relaxing, calming effect, increasing metabolism and blood circulation. 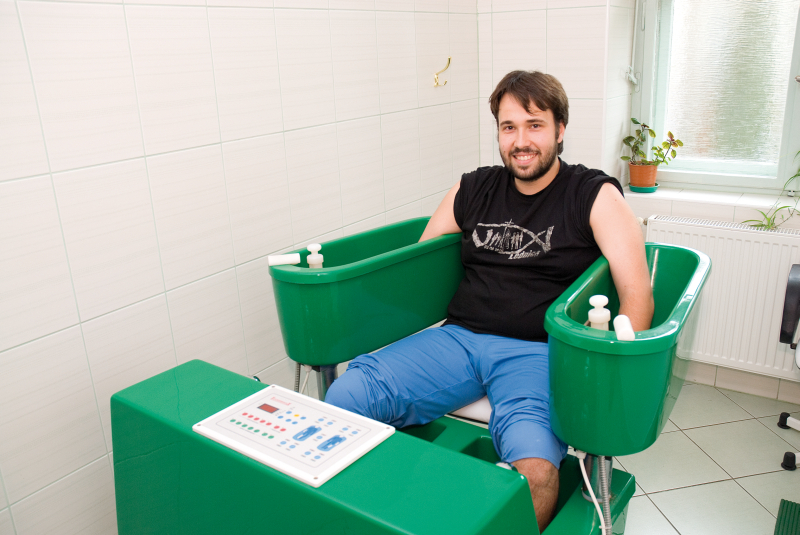 The impact of the bath is intensified by the use during the procedure - chromotherapy, i.e. the influence of colours on the human body. With the start of a gentle massage with compressed air in the bathtub, the additional illumination of the water begins by the light in a warm colour tone, which goes out as the program ends. Violet - stimulates all energetic processes, does not facilitate concentration, promotes creative activities. It is a procedure performed in a bathtub with therapeutic thermal water, to which water is injected through special nozzles under a sufficiently high pressure, causing a hydrodynamic effect. The healing effect of this treatment is due to the combined physicochemical, thermal and mechanical effects on our body. The healing effect of hydromassage is compounded by the use during the procedure - chromotherapy, that is the interaction of colours on the human body. Chromotherapy is one of the newest types of interactions used in hydrotherapy. Light emission, in different colours, takes place through bathtubs built into the basin, which act as single light sources with permanent colours. With the activation of the hydromassage in the bathtub, the additional illumination of the water begins by the light in a warm colour tone, which goes out as the program ends. Green - has a soothing and calming effect, promotes restoration of mental balance, relieves the effects of stress, reduces arterial hypertension, has a positive effect on the heart and the organ of sight. Yellow - increases the sensitivity of the senses, helps to reduce the symptoms of depression. Red - strongly stimulating, both intellectually and emotionally. Indicated for paresis (increases willpower). It increases blood pressure. Blue - calms, relaxes, but does not work soporific. It eliminates emotional fluctuation, promotes concentration. It facilitates the metabolism, improves the work of the heart and circulatory system. Violet - stimulates all energetic processes, does not facilitate concentration, promotes creative activities. It relieves the symptoms of insomnia, supports the treatment of migraines. Training with the use of devices. In continuous training, physical effort is constant. Interval training is a high intensity interval training - a form of physical training strategy involving interweaving short periods of very intense effort with short periods of moderate effort. Morning exercises conducted by qualified physiotherapists of the Cieplice Health Resort are a great way to start healthy day. We invite both patients and residents of Jelenia Góra. Note: classes will not take place in the event of rain. Uzdrowisko Cieplice Sp. z o.o. - Grupa PGU reserves the right to cancel classes without giving a reason. The treatment is a variation of the massage and consists in alternating air injection into special cuffs placed on the upper or lower limb. The cuffs thanks to the chamber construction have the ability to fill the chambers in the selected order and scheduled time and pressure. The chambers in the cuffs overlap each other, preventing any breaks in the tissues being massaged during the procedure. helps to eliminate swelling and the feeling of heavy, tired legs. 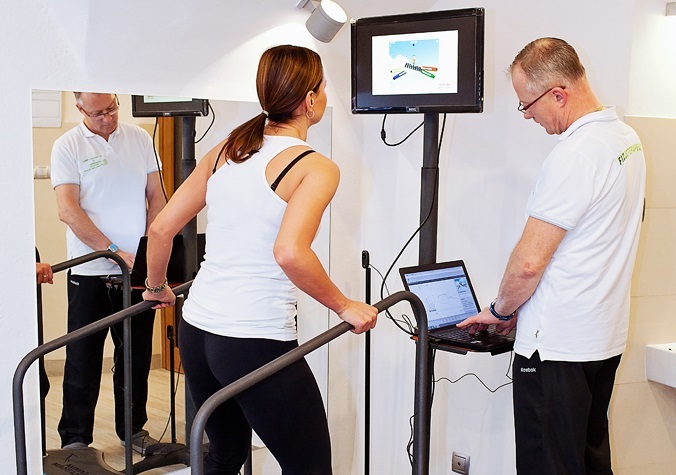 The modern two-board Gamma platform enables professional training of patients with disorders: balance, sensomotor control, neuromuscular coordination (coordination of the body), load distribution disorders. Its additional advantage is the possibility of any setting of the boards in relation to each other, which allows you to plan the functional training of athletes in a specific position, closely related to their discipline. In the case of the discussed training using the Gamma platform, additional - visual and audio feedback is sent. The use of visualization as feedback (biofeedback), improves the motivational value and attractiveness of training compared to traditional exercises. Thanks to the patient database, we can keep a reliable record of progress in rehabilitation, which can be useful for physicians, patients or insurance companies. Motorized rail for continuous, passive mobilization of the knee and hip joints. A set of rehabilitation exercises tailored individually to the condition and possibilities of the Patient. Exercises conducted under the individual care of a physiotherapist. 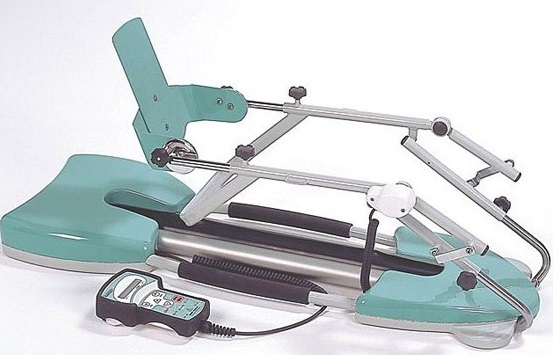 We invite you to take advantage of the only Lower Silesian traction treatment of the lumbar or cervical spine performed on a special 3D traction table designed for this purpose. The traction of the spine is the distance between joint surfaces of neighboring vertebrae. Increased intervertebral space results in reduced pressure on irritated spine structures and re-hydration (rehydration) of intervertebral discs. The analgesic effect achieved during the procedure is recommended in acute painful conditions of the spine, especially in the case of intervertebral disc hernias, exacerbation of degenerative changes in the spine. The procedure is performed in a lying position on the stomach or back. Thanks to the possibility of correction of the table in many planes, the patient is placed in the position for him as painless as possible during the procedure. Taking into account the medical indications and the clinical condition of the patient, the physiotherapist selects the parameters of traction forces acting on the spine. 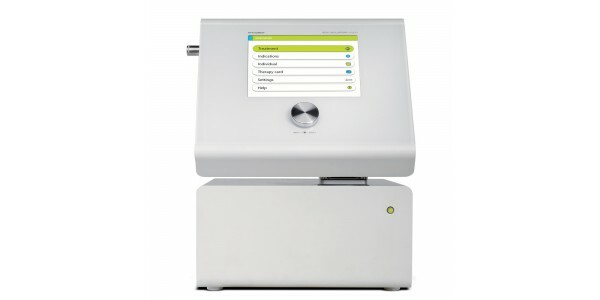 The average duration of the treatment is in the range of 20 - 40 minutes. The series of 10 tractions used twice a week is able to release pressure and swelling of the root, reducing the dose of painkillers, which can be achieved after the first treatment. Dry baths in carbon dioxide CO2 is a procedure based on proper dosing of the lower body with carbonic acid anhydride for people who, due to coexisting diseases, can not enjoy the so-called "Wet" carbonic bath, where there is an additional hydrostatic pressure on the patient. Dry baths in CO₂ do not require removal of outerwear. For people with a disfunction of the motor organs, this treatment may replace wet baths due to the easiness of treatment. The healing effect of carbon dioxide CO2 is the expansion of capillaries, arterial and venous vessels due to the release of histamine-like bodies and acetylcholine in the skin. The effect of such action of the CO₂ therapy is drop in blood pressure, both normal and increased because od desease pressure. The described process takes place without the participation of an additional thermal factor. Treatments in carbon dioxide gas, i.e. dry treatments are recommended in the case of concomitant cardiological or cerebral vascular diseases, where the use of hydrostatically and thermally charged wet carbonic acid baths is excluded. After the carbonic acid baths there is general calm, improved well-being, sometimes feelings of laziness and drowsiness. diabetic gangrene (accelerates the healing of open wounds). Effective weight loss and cellulite reduction can be carried out only with significant stimulation of metabolism, detoxification and elimination of excess fluids. The use of anti-cellulite means during the session in the capsule increases their effectiveness, and thus allows you to achieve the expected results faster. Another factor that increases the effectiveness of cellulite removal is the earlier use of deep oscillation of "Deep oscillation" from our set of treatments available in the Health Resort. The capsule provides completely new opportunities for weight loss. LED infrared light produced by LED-LIM panels penetrates up to 4 cm deep into the body and warms up the body without using air as a carrier. Thanks to this possibility, the body sweats a lot more and loses 250% more fluids than in a traditional sauna. This solution causes the body to release not only water, but also burns body fat, reduces cholesterol, removes heavy metals, acids and toxic compounds. During one 30-minute session, the body burns about 600 to 800 Kcal - that is, as much as after running 5-8 km. It is a multifunctional device that stimulates the sense of touch, smell, sight and hearing. It combines therapeutic and cosmetic treatment with biological renewal ensuring full comfort and pleasant relaxation. In addition, the capsule offers the functions of a dry sauna, infrared, vibrating and pulsed massage, provides aroma therapy, herbs, music and coloured light, creates a haze of vitamins and minerals. Therapeutic sessions are varied. Each session can be adapted to the specific needs of the client. An important feature of this device is synergy, that is, the interaction of several factors that, in combination, produce much greater effects than their sum when acting alone. oxygen therapy using a pure oxygen generator with the possibility of setting the treatment on the body in the chamber or on the face. vibrating bed with adjustable vibration power for the lower and upper parts separately.